You can on your own or with our help develop your route of a tram or trolley bus. Plenty of room for imagination, we are limited only by the presence of tram / ​​trolley-bus ways and duration of your trip. and see how your route can look like. Tram departs from the Srednii pr. Vasil’evskogo Ostrova (guests can come aboard near the metro station “Vasileostrovskaya”) and goes to the center. During the 3-hour trip you can make 2 stops: 1 – on the Square. Turgenev, there is a small park, where guests can take a walk and take pictures with the TRAM on the background. 2 – an area near the Circus, Mihajlovskij Castle and old embankment of Fontanka – perfect places for small walks. The final landing is made on Srednii pr. VO. On this route you will see the whole center of St. Petersburg. Tram departs from the Srednii pr. 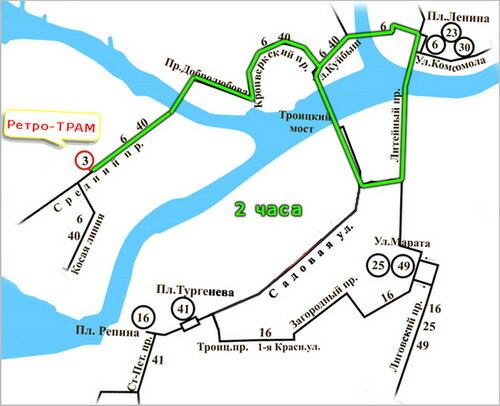 VO (guest pick up is possible near the subway “Vasilyeostrovskaya”) and goes to the center. Over 2 hours you can make one stop at the square near the Circus. Mikhailovsky Castle and the Fontanka embankment – a great place for photos during your holiday or excursion. The landing is made on Srednii pr. VO. By choosing this route, you will quickly ride through the main streets of St. Petersburg. 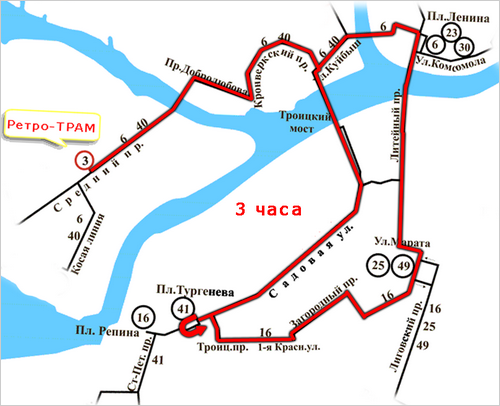 From the metro station “Rybackoe” – Obuhovskoj Oborony ave - past the garden of “Spartacus” – to the coastal church “Kulich and Easter” – to the garden “Kurakin dacha” – by Volodarsky bridge – to park “Babushkina ” – travel along the Neva River – Alexander Nevsky Lavra – the bridge of Alexander Nevsky, Zanevskaya square. Ushakovsky Bridge – Kamennoostrovskij Ave – Kamennoostrovskij Bridge – Pesochnaja Embankment – River embankment Karpovki – Ioanovsky Monastery – Petropavlovskaja Street – Street Leo Tolstoy – Chapaev Street – on the street Kuibyshev to Mosques – by the Peter and Paul Fortress on the Kronverkskiy Prospect Avenue to Dobrolyubova – through Tuchkov Bridge – on Vasilevsky Island – on the 1st and the Cadet line – Srednii pr. - 22-23 lines – Kosaja line Cinema, “Priboj”. From cinema “Priboj” – Kosaja line – the 22th and 23th lines – Srednii prospect of Vasilevsky Island – 1st and Cadet line – Tuchkov Bridge – Dobrolyubova Avenue – past the Peter and Paul Fortress by Kronverkskiy avenue – at Kuibyshev Street to Aurora – through Sampson bridge – to the Finljandskij prospect – G.Sampsonievsky avenue – Botkin street – the street Academic Lebedev – Street Komsomola (in the opposite direction Botkin street). From the square Repin – on the street Sadovaja - by Lermontov Avenue – through Egyptian Bridge – up to Troickij Avenue – Izmajlovskij Cathedral – 1st Krasnoarmejskaja Street – Zagorodnyj Prospect – Zvenigorodskaya street – street Marata – Svechnoj lane (in the opposite direction Kuznechniy) – Ligovskiy – Rasstannaya Street. – Rasstanny Lane – River embankment Volkovka – by Literatorskie catwalk to the street Mginskoy. Metro “Avtovo” – Stachek – Peterhof highway – Strelna. * The specified length of the trip does not include the time for the Tram to be delivered and returned to the park.